Time is short, short of money, (not so much), money is doughnuts today…basically I have about 30 min. of lunch today since my project has become, well, a bit hairy. The Plant is the closest stop to the main doors at Falchi’s; here we go. Luckily for me, the doughnuts that I want had abundant supply. So, will I become lucky with the ones I have chosen? Their take on the samosa is fascinating: yes, one also fries a doughnut (the yeast ones), but a yeast-samosa is a completely different mouth feel than a traditional crispy samosa. That being said, that savory doughnut was quite delicious. The potato filling had a lot of peas in it (green) and raw slivers of carrot which poked out of the dough, giving it some crunch again the curried potato and pea mixture. Very portable and tasty. 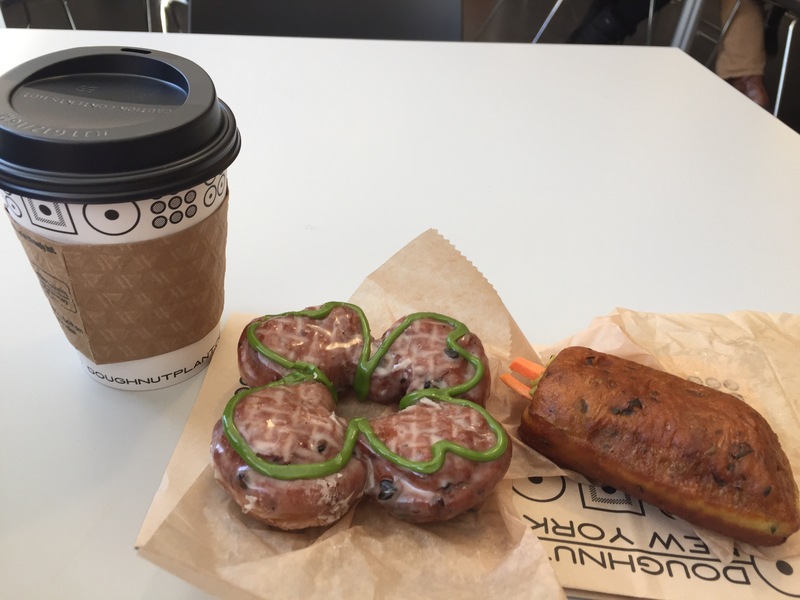 The lucky shamrock: a Irish soda-bread dough with caraway seeds, iced with green icing and a simple sugar glaze, shaped in a four-leaf clover. Anyway, it was fine. For real Irish soda bread, it needs some raisins.